The 2018 Joseph A. Holmes Safety Association (JAHSA) and Holmes Mine Rescue Association awards ceremony was held on June 7. JAHSA began in 1916 to promote health and safety in the mining industry and consists of representatives from federal and state governments, mining organizations and labor. Nonmetal (Group II): Kansas Sunflower Safety District Council. Nonmetal (Group III): Greater Northeast District Council. Metal/Nonmetal (Group III): Industrial Minerals District Council. Coal (Group I): Scotty Groves District Council. Coal (Group III): Anthracite District Council. (Group III): Industrial Minerals District Council. • Man of the Year Award: Sammy Linville – Carmeuse North America. In addition to the safety association awards, the West Virginia State Council of the Joseph A. Holmes Safety Association sponsors awards to promote safety in West Virginia coal mines and facilities. 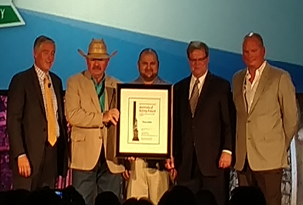 Additionally, the superintendent of the Highland Underground Belt System, Gary Meade, was honored with the director’s Special Recognition Award from the Aracoma Council.